Miles Howe is a PhD candidate in the department of Cultural Studies at Queen's University. His research focuses on the history of counterinsurgency in Canada. Jeffrey Monaghan is an assistant professor of criminology at Carleton University, Ottawa, Canada. Sean O’Rourke is an interdisciplinary studies (psychology and geography) graduate student at the University of Northern British Columbia researching the intersection of meaning in life and land-use with Eveny reindeer herders in Siberia. Although he grew up in Calgary, Sean has lived in northern BC for the past two years. He has spent the past four years undertaking anthropological and psychological research in collaboration with Indigenous communities throughout the circumpolar north. Nikki Skuce enjoys commuting by bike but has never self-propelled herself across the country, let alone the continent. She is the director of the Northern Confluence Initiative based out of Smithers, B.C. Melissa Sawatsky is a writer currently living on unceded Witsuwit'en territory in Smithers, BC, where she works at the Smithers Public Library, as well as serving on the board of the Bulkley Valley Community Arts Council. She also facilitates creative writing workshops for young writers. Her work has appeared in Room Magazine, Northword, The Maynard, Poetry is Dead, Sad Mag and Rhubarb, among other publications and anthologies. She has an MFA in creative writing from the University of British Columbia. Trina Moyles is an award-winning Canadian author and journalist. Her work has been widely published in The Globe and Mail, The Walrus and Modern Farmer. 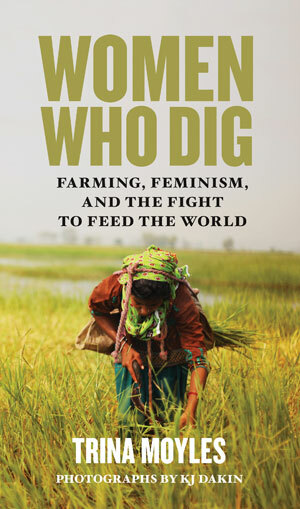 Her first book, Women Who Dig: Farming, Feminism, and the Fight to Feed the World (University of Regina Press), has received critical praise from scholars and authors, including Raj Patel, who calls the book “haunting, powerful, and important.” Learn more at www.trinamoyles.com / www.womenwhodig.com. Richard D. Lewis is one of Britain’s foremost linguists. He brought Berlitz to East Asia, Portugal and Finland and spent several years in Japan, where he personally tutored Empress Michiko and five other Japanese Imperial Family members. When Cultures Collide, his guide to world business cultures, has sold over one million copies, is in 15 languages and won the prestigious US Executive Book Club award. He currently lectures throughout the world on cross-cultural issues and writes prolifically. His latest book, with Kai Hammerich, is Fish Can’t See Water. In 1997, Richard received a Finnish knighthood, for his 40 years’ experience helping Finland develop international links, including preparations for EU presidency. In 2009, he was promoted to Knight Commander, Order of the Lion of Finland. For further details, check out his book, The Road from Wigan Pier. Jane Stevenson was born in Newfoundland, raised in Kitimat and has called Smithers, BC home for just over 18 years. She has written two historical nonfiction books, The Railroader's Wife and A Trail of Two Telegraphs. Her fiction has been published in journals across Canada and she is currently working on a novel set in Kitimat in the 1950s. Sarah Duignan is a PhD candidate studying the anthropology of health at McMaster University. Growing up in Peterborough, Ontario has strongly influenced her connection to the natural world and to food and landscapes. She graduated with a BSc in 2013 from Trent University and then moved to the prairies for a master’s degree in anthropology at the University of Manitoba (2015). She currently works with Indigenous communities, collaborating on health research that situates wellbeing in connection with water quality and access for her doctoral research. She is also the creator and host of AnthroDish, a podcast about food, culture and identity. She currently lives in Toronto with her rad partner and her cheeky little toddler. Shelley Worthington is a student at Vancouver School of Theology working towards a Master of Divinity degree. She is from the prairies, born and raised in Calgary, Alberta, on Treaty 7 territory, and currently lives on Witsuwit'en territory in Smithers, B.C. Her first degree is in community rehabilitation and her work revolves around community/citizen engagement, facilitation and conflict management. Emily Bulmer is a freelance writer living in Smithers, B.C. on the territory of House Gitemden, Wet'suwet'en First Nation. When she has time, she loves exploring her corner of the universe: the mountains and rivers of the Skeena watershed. In years past, Joanne Campbell wrote fiction and fact for print and radio. Then, with a Master of Arts in Communication from Royal Roads University, she came to Smithers, B.C. and spent a decade as publisher of Northword Magazine. Now, she is an expeditor exploring her options. In the future, she will come back as a cultural anthropologist and explain why rich men try to catch the wildest of fish, only to let them go. Sangsun Choi is a visual storyteller whose work focuses on an ethnographic approach to social minorities and vulnerable people. His documentaries and photographs explore not only the value of truth but also an artistic representation of human life. Originally from South Korea, he has made dozens of pieces about child labour, North Korean defectors, war refugees, disabled people and immigrants. Sangsun has presented his work at film festivals worldwide, including Athens International Film and Video Festival, Big Sky Documentary Film Festival, RiverRun International Film Festival, Wisconsin Film Festival, ETHNOCINECA-International Documentary Film Festival Vienna. He is also a winner at the Broadcast Education Association Festival of Media Arts in 2018. Sangsun is currently working as an assistant professor of media production at Malone University in Canton, Ohio. Hayley Aikman is a postgraduate student in anthropology at Victoria University of Wellington. Her current research for her MA focuses on motherhood, and the way that mothers outside of heterosexuality experience parenting in New Zealand. She is also interested in decolonization and critiques of capitalism, and the way that these relate to gender, sexuality and kinship norms. Lydia Howard, originally from New Zealand, has a Bachelor of Arts with a major in English literature and a diploma in creative writing. Lydia grew up on a sailboat and spent her childhood writing, drawing and imagining. She has worked in education policy, provided communications for non-profit organizations, dabbled in freelance writing and written and illustrated a children’s book. Lydia lives in Smithers, B.C. and currently spends most of her time chasing after her four-year-old daughter and two-year-old son. George Nicholas is an anthropological archaeologist who has worked closely with and for Secwepemc and other First Nations in British Columbia and Indigenous groups worldwide for the past 30 years. He is Professor and Chair of Archaeology at Simon Fraser University and adjunct professor at Flinders University, Australia. George was the founding director of SFU’s Indigenous Archaeology Program in Kamloops (1991–2005). His work focuses on Indigenous peoples and archaeology, intellectual property, heritage protection, the archaeology and human ecology of wetlands, and archaeological theory and practice, and includes an activist orientation. He was also the director of the Intellectual Property Issues in Cultural Heritage (IPinCH) project, a seven-year international collaboration organization concerned with the theoretical, ethical and practical implications of commodification, appropriation and other flows of knowledge about heritage. Carla Lewis is from the Gitdumden Clan of the Witsuwit'en Nation. She is an anthropologist, photographer and mother to her feisty eight-year-old son. Michelle Vander Wal is an elementary school teacher in southwestern Ontario. After gaining a BA in North American archaeology, Michelle pursued a Master of Theological Studies in Early Christian History. Finding a teaching job that kept the same hours as her three children led her to complete a B.Ed. as a second career. Michelle enjoys teaching social studies in her classroom and educating a new generation of Canadians to appreciate a wide variety of cultures and ask critical questions about their world. Landis Wyatt has lived in Liberia since 2007, working for Universal Outreach Foundation, a West Vancouver-based charitable organization. Along with the beekeepers of Liberia she has spent the past six years marvelling over bees. Erica McCollum finished her doctorate in sociology from UBC last year. She also obtained her MA in Adult Education and Community Development from the University of Toronto where she studied participatory governance in the Toronto Community Housing Corporation. She studies culture, political participation and social psychology and is currently working on publishing articles from her work on culture and political participation. She is also focusing on being a new mom with her six-month-old baby, Taykla. She lives in Smithers, BC, where she loves to get out cross-country skiing and hiking. Moe Kafer recently opened Roadhouse Restaurant in Smithers with her sister after spending 17 years in England working as a food photographer and filmmaker. Her award-winning photography captured not just food, but the people who created it and the places that inspired the flavours; she created beautiful culinary narratives that brought to life the culture of food by illustrating the ingredients and prepared dishes, the settings in which they were inspired and prepared, and the people who cook them: chefs, cooks, food producers, restaurants, hotels, markets or locals. Moe takes a photojournalistic approach to her food photography and films, using primarily natural light and highlighting the beauty of the food, working both in-studio and on-location to create high-impact visuals for advertising, publishing and editorial clients. See more of her work at www.moekafer.photoshelter.com. Joanne Hammond is an archaeologist and anthropologist in BC, where she lives and works in the unceded territories of the Secwepemc, Syilx and Nlaka’pamux nations. She serves on the Kamloops Heritage Commission and is a program advisor with Simon Fraser University's graduate professional program in heritage management. Joanne is active in outreach with schools, museums, community groups, professional organizations and governments to educate learners of all ages about Indigenous archaeological heritage and the history of Indigenous peoples and the Canadian state. She believes that we can craft socially responsible and morally defensible approaches to heritage research and interpretation that can produce outstanding human stories. Joanne’s on the web at republicofarchaeology.ca and on Twitter @KamloopsArchaeo. Trevor Jang is a writer based in Vancouver. His investigative journalism focused on Indigenous issues and communities has appeared in Discourse Media, B.C. Business magazine, CBC Indigenous, Reveal from the Centre for Investigative Reporting and the National Observer. Trevor was a recipient of the 2016 CBC Indigenous Fellowship through the Canadian Journalism Foundation and a chosen participant of the 2017 Literary Journalism Residency at the Banff Centre for Arts and Creativity. He is a mix of Chinese-Canadian and Wet'suwet'en Nation descent. See more of his work at www.trevorjang.com. When asked, Christine Bruce—who currently lives and works in Witset (formerly Moricetown)—describes herself as the "village cheerleader." Witset has a long history of colonization and trauma, but the members are working hard to find their past while plugging into the future. Inspired, Christine tells their stories through a celebratory lens. As the Communications Coordinator, her role entails sharing Witsuwit’en news and events through a wide range of media including a monthly newsletter, all social media outlets, a Flickr page, a blog, and until recently, a weekly spoken word broadcast on CICK 93.9 FM. This year, she’s registered for a Community Economic Development course at Simon Fraser University, where she hopes to improve her skills as a cheerleader and a storyteller. Tyler McCreary is an assistant professor in the Department of Geography at Florida State University. His research focuses on how Indigenous-settler negotiations shape the governance of northern resources, labour markets, and communities. Keli Watson has been studying and working as an applied archaeologist for over 20 years. Keli completed her BA in Archaeology of the Near East at Wilfrid Laurier University and her MA in interdisciplinary studies at the University of Northern British Columbia, where she combined anthropology with First Nations studies to apply practisable methods of involving First Nations rights and traditions with the practices of field archaeology and artifact analysis. Keli has had an exciting career in cultural resource management where she has worked as a lab manager, field director, project director and senior archaeologist on a variety of projects throughout Ontario and British Columbia. Jezelle Zatorski has been a practising Indigenous archaeologist for 20 years in both British Columbia and Alberta. Jezelle studied at the University of Northern British Columbia and completed her BA in archaeology at the University of Calgary. Starting her career as a Dakelh First Nation assistant representing Lheidli T’enneh First Nation, Jezelle has continued on the path of engaging local Indigenous groups as a traditional knowledge facilitator and socioeconomic advisor in Indigenous community relations, and working on traditional land and resource use studies, traditional ecological knowledge studies and environmental impact assessments across Canada.